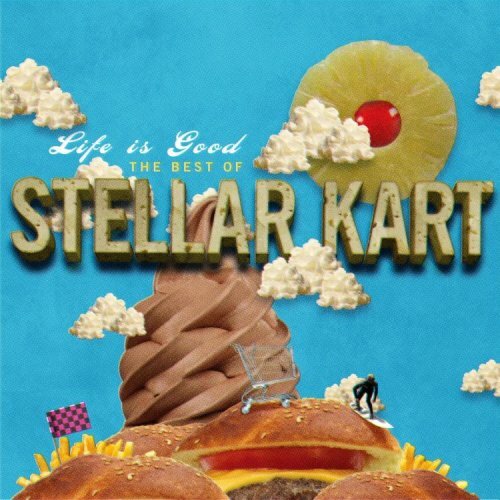 Stellar Kart is a band that I have been meaning to listen to for a while now, and I'll be honest, I've never really got round to it on the basis; do we really need another Christian American punk pop band? Little harsh? Maybe. However they have just released a 'best of' album combining their top tracks from their three CDs. So this seems like a perfect opportunity to tune in and have a listen to their best 17 tracks. The album contains several of the bands singles, such as the title track Life is Good and Me and Jesus which was number 1 in the 'Hot Christian Songs' for seven weeks when it was released. It has been put together in four sections; tracks 1 through 4 are taken from their first album, All Gas, No Brake (2004), tracks 5 through 9 are from We Can't Stand Sitting Down, their second album (2006), 10 to 14 are taken from their most recent album Expect the Impossible (2008) and then the final three tracks are unreleased tracks, one original and two covers. The first section is pretty much what I was expecting, a loud punk pop sound in the first three tracks which leads in to a more mellow thoughtful track four (Finish Last). The chorus to Finish Last really do stick in your head; 'I want to finish last, last in the world's eyes, no matter what I do, I will be first in your eyes'. The song talks about who we, as Christian, should be pleasing, the world or Jesus? Me and Jesus (track 5) leads out of the first section and into the second album. It is great link from Finish Last; starting in the same quiet, cut back, sound however then really builds into the loud upbeat chorus. Again, as with the previous section there is this rise louder tracks, back down into the quiet tracks. Into their latest album, and again there is this quiet lead into Angels in Chorus (track 10), which builds into Jesus Loves You (track 11). There is a subtle difference between the third section and the second, the sound is a lot brighter, more energetic if that is possible, it is almost impossible not to enjoy Innocent (track 12)! The final section, made up of the rarity and covers provides a little extra for the fans who are buying this album to support the band. Lifeguard (track 15) is a big bouncy track that didn't make it onto Expect the Impossible. Centerfield is a cover of the John Fogerty track from the same album, and Punk the Halls is a 'punked-up' recording of the Christmas tune Deck the Halls leading into Oh Come All Ye Faithful, slightly odd considering it is April, however we'll get over it! I think that there are three possible ways to take this album, either you are not really a fan of the punk pop sound and as a result this album isn't really for you. If you like the punk pop genre, like Relient K or Hawk Nelson, then you can swing two ways; there is a very similar sound, there were times when I could of joined a Relient K track in a Stellar Kart track, and as such you could choose to write them off as being 'just another punk pop band'. Alternately, Life is Good provides another great sound to fit well into a summery playlist, alongside other similar bands. I personally think that the album has a really great sound and is well put together, I love the way the tracks fit into the same order as their album release, and you can hear the musical progression between the three albums. I'm going to be spending the rest of the day listening to their back catalogue, I'll reserve judgement on the Livin' on a Prayer cover on All Gas, No Brake though!